Are Stevia, Truvia or PureVia Safe? The leaf above is from a Stevia plant and the powders and pills are the sweeteners derived from it. What is Stevia? Stevia is a South American plant from the chrysanthemum family, grown and used by locals for its sweet tasting leaves. Stevia extracts are 200-300 times sweeter than sugar, but contain no calories. This has made stevia an alternative to sugar and artificial sweeteners such as aspartame and saccharine. Stevia is an herbal extract. Aspartame, saccharine, or sucralose (Splenda) are made from chemicals in a manufacturing plant. But, the leaves of the stevia plant are not just ground up and served to us. There is a bunch of processing that goes into getting the best calorie free sweetener. Manufacturers want to isolate Rebaudioside A because it has the least bitterness of all the sweet compounds in the stevia plant. To produce rebaudioside A commercially, stevia plants are dried and subjected to a water extraction process. This crude extract contains about 50% rebaudioside A; its various glycoside molecules are separated via crystallization techniques, typically using ethanol or methanol as solvent. At this point, you begin to wonder if there is a BIG difference between an herbal extract and a synthetic sweetener. They both spend some serious time in a manufacturing plant. In December 2008, the FDA gave rebaudioside A (or reb A) approval for "Generally Recognized As Safe" status. Back in 1991, the FDA restricted stevia's import because there wasn't enough toxicological information to demonstrate its safety. What changed? Well Cargill and Pepsico both developed reb A products, Truvia and PureVia (respectively). And, there have been more toxicological studies showing that it doesn't cause cancer. There is one outspoken group - the Center for Science in The Public Interest - that believes that there should be more study of stevia in mice before we start a large experiment on ourselves with the stuff. You see there are a bunch of studies in rats - but, they believe, not enough research in mice to prove that stevia is safe. The good news is that stevia didn't cause cancer in rats and that the World Health Organization (WHO) did a study in 2009 and also concluded that stevia is safe. My thinking is that as with any additive, the best plan is moderation. If you like the taste of stevia than use it to sweeten things - but don't go over board. No toxicological study is going to be able to gauge the effect of large doses of anything on humans over many years. We are just subjected to too many different environmental factors. 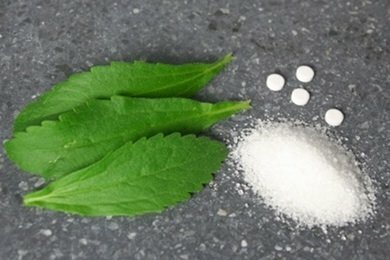 What do you think of stevia based sweeteners? I found that when I used Splenda for a while, my body started to get aches and pains. When I stopped, I felt much better. Now I am using Truvia but am feeling achy, joins hurt, etc. again. Not sure if it is my imagination or not. Will quit any "non-sugar" and see what happens. Does anyone else experience this? I was diagnosed as Insulin resistant about 4 weeks ago. Since then, I have learned that Stevia is the only "safe" sugar substitute for my body. Artificial sweetners cause your body to produce more insulin because it thinks you are having sugar. THIS IS NOT GOOD. Stevia, however, reacts in your body differently than other artificial sweetners. It does not cause an increase in insulin production. This in turn lessens the cravings for sugary foods and drinks. Trust me, I didn't believe it at first but 30 days later, I am proof!! I rarely use artificial sweeteners. But if I have too much Splenda, I know it because I feel headachy. But I have not had the same reaction with Stevia so far. Although I'm generally all for whole foods, a little processing isn't always a horrible thing. Pasta is a processed food - and I'll buy it because I sure don't want to make it myself. (I have made pasta from scratch - and I swore I'd never do it again!) Yes, real Stevia does go through some processing but if you're getting the real thing no additional ingredients should be added. That is not true with Splenda, Truvia, or PureVia. And that's where things get tricky. An ingredient in Truvia is "natural flavors" - what does that even mean? (hint: think corn). With all other artificial sweeteners I have experienced an aftertaste. Not true with Truvia. So I do use it in moderation. I have used Stevia w/ chromium , I us about 3 packets a day for hot green tea. I haven't heard any negative from Stevia. I bought it at the health food store. I guess we can all use Honey or Agave! it's not even legal here in the UK! Yes, in response to the stiffness and pain in the fingers. That happened to me too. Really weird. I, too, think I will either use REAL sugar or no sugar for a while and see what happens. Thanks! We need to examine how often we are enjoying cakes, cookies, and sodas, and consume them less. There is so little food value in these types of foods. They don't make us look and feel better, so why do we eat them as frequently as we do? Eat real sugar, but eat it infrequently. You don't need to eat a cookie or some cake every night. Why are we poisoning our bodies with lab-created sugars? I use pure stevia extract powder most of the time, but in cooking I started looking at Truvia and Stevia in the Raw. Truvia had 7 carbs per serving. Stevia in the Raw had less than 1 and stevia extract powder had none. It makes you wonder what they have snuck into Truvia to add 7 carbs per serving. Remember that Truvia and Stevia are not the same thing. Stevia is generally derived from the whole leaf. While there is a process to make it into a liquid or a powder form, it's based on the whole leaf. Truvia is based on the extraction of the single compound. It's not a whole leaf product. Just as refined grains have little to do with the health benefits of a whole grain, whole leaf stevia has little to do with Truvia. Knowledge is power! I have out-of-body experiences with Splenda!I'm a fan of Zero Vitamin Water which contains stevia extract. It agrees with me. We've been using NuStevia for a while & like it very much (http://www.nunaturals.com/). There is no aftertaste and a little goes a very long way. We were recently introduced to xylitol as a sweetener and are trying it out as well. We like that neither of these sweeteners spike blood sugar, as diabetes is a problem in both of our families. I do have to add to some comments about using real sugar~ my yoga instuctor from India says she uses the brown raw sugar. Its pure and natural and safe, she uses it in all her baking and dishes. Now that makes a lot of sense! And she said of course "in moderation". One thing that can be said for Stevia is that it has been used in Asian and South American countries for a long time. Whether their version is less processed than ours is a good question though. I will say, unfortunately it's too strong tasting for me to put in coffee, and I usually only use it in tea, which is disappointing. I have only used the Trader Joe's brand though, not the new Pepsi brand which might taste better. How is "real sugar" made? I thought it was processed from beets?